Continue your collection with our second annual Capitol ornament. The 2016 ornament shows the Capitol during the Christmas festival of trees. This beautiful scene shows the decorated trees with the scene looking from the main floor of the Rotunda toward the grand staircase. It also features the stain glass barrel vault above the staircase. 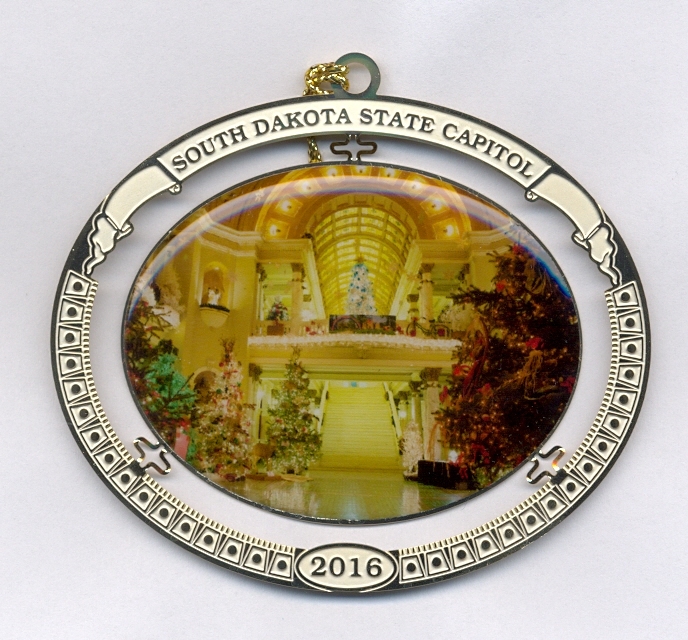 The top of the ornament has a white sash that reads "South Dakota State Capitol" in gold letters and the bottom shows the year 2016 in gold letters. This collectible ornament will arrive in a red case with a distinctive ornament presentation on the cover. This makes a wonderful gift to family and friends. Also consider the 2015 first annual collectible while the limited quantities remain available.